Hey newbs! This game will show you what everything does. To move, use the right mouse button or the arrow keys. 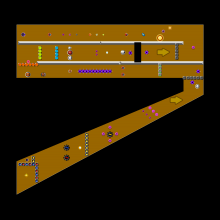 Here's the weapons and there keys: Space Bar=Bullet, the basic, unlimited ammo weapon; Z=Missle, it follows the opponent; X=Ray, a beam that is a little more power full than the bullets, no ammo; C=Bomb, almost like a grenade; V=Mine, just like what a mine would do! ; B=Bot, it uses up your missle ammo, fire a drone that fire bullets at enemies! I hope you like sploder!